Our week has been super busy and so we took a little longer than last week to explore the story of Noah. As always our first port of call was to read the story in our children’s bible. The story was actually longer than I thought it would be and so took a couple of attempts to get the whole way through. Throughout the week during quiet spots in our day where we had nothing on we occasionally flicked through the pages and I would describe the images to my little one. One of the most fun activities we did this week was marching. Sometimes we would sing the “Animals go marching in two by two” song, sometimes we didn’t. (For context when I say “we” marched, what I mean is that the majority of the time I was marching round the lounge, while my little one looked at me funny, followed by her stomping her feet and laughing.) We also marched outside on our walks, at least when no one was looking. We are most fortunate to have zoo membership to our local zoo and this was a really good way to spend a morning showing little one some of the animals in the ark. However, if you don’t have a zoo nearby do not despair we also went on a “bug hunt”. Thinking I was being clever we took off on a walk in the beautiful sunshine, searching high and low for bugs, in which we found 10,000 flies and 0 other bugs. But I am sure you get the picture. You could also look out for other wildlife and talk about their role in the story. It’s been a poor week for animals, other than the ones in the zoo as there have been no birds or cats when we have looked out the window together either!!!! 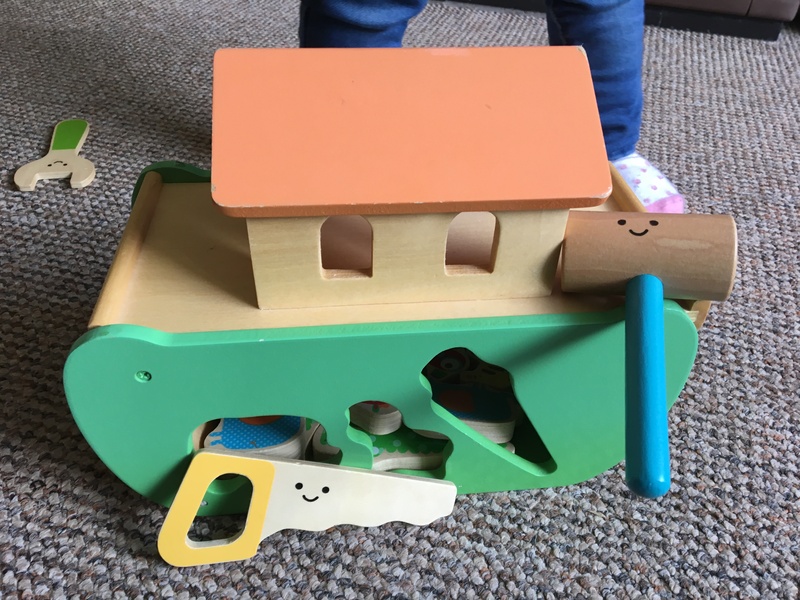 We have a Noah’s Ark wooden toy and it is a toy that lives on my windowsill and brought down to play with when we need it. This is not because it is perfect and needs to stay that way but because it is the perfect toy to keep my little one happy for a while, with loads of ways to play with it. I use it when I need that simple time. The time where she explores it while I have a few moments and then the time to show her new ways to use it. This week the toy came out and we talked about the animals and then used it to act out the story. A blue blanket came out for the sea and our musical, dancing, light up toy represented the rainbow. I highly recommend Noah’s Ark toys! There were lots of other little tasks we did throughout the week. We coloured in animal masks; we talked about colours, looking for colours everywhere we would go; and we did more colouring. I’ve found myself talking to my little one throughout the week about the story. It has given me time to reflect myself upon the story and the meaning. Sometimes I would talk at my little one about my thoughts, other times we would be doing something else and I would reflect on how it might relate to the story. One of my favourite things we introduced this week was a space for prayer. We used some of our prayer books and said a prayer about God’s promises. If you do not have any children’s prayer books you may find a prayer on the internet or make one up. I pray that you are connecting with the stories of the bible in new ways. Next week we will be moving on to a New Testament story, called Jesus Calms the Storm. If you have any ideas on other bible passages you think I should try comment below.